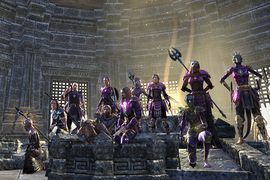 The United Explorers of Scholarly Pursuits is the official in-game guild of the UESP in Elder Scrolls Online. 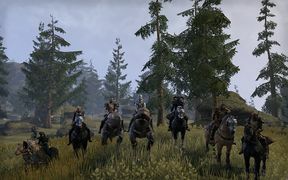 There are currently four branches, one for each PC server, one on the North American Xbox One server, and one on the European PlayStation 4 server. There is also a subforum for the official guilds on the UESP forum, found here, which is used for planning and advertising events, and can also be used to ask questions about the guilds. Members are encouraged to install the uespLog AddOn for a few useful utilities and to help collect game data for the site. The Alliance affiliations listed here only affect PvP; members of all Alliances are welcome to join UESP. 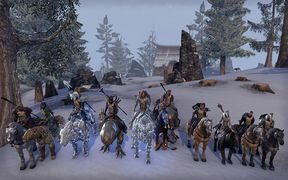 This guild is open to all admins, editors, and users of the UESP to provide a place to meet up, talk about the game, the UESP, or life in general. If you need help with a quest or world boss, or want to run a group dungeon, just ask on chat. Information about our social activities can be found on our calendar or the in-game Message of the Day (MOTD). We are a very diverse group of people. Our members range in age from 14 to 60+ & hail from 5 continents. We are of different cultures, religions including none, sexual orientations, & some have disabilities or long-term health conditions. The one overriding rule of the Guild is that you respect your fellow guildies, even if you disagree with them. Heraldry: Imperial Purple/Gold on Chevron 4 with a Silver Eye of Hermaeus Mora, representing the Daedric Prince of Knowledge and Memory. Gold represents the color of UESP site pages. 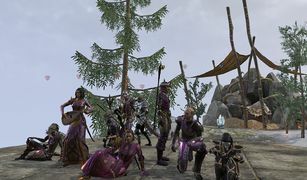 The other two colors were chosen by a vote among Guild Members, with a deep purple being the most preferred/least disliked. Guildmaster The leader of the entire guild. This person is responsible for making sure that the guild lives up to its stated purpose and that every aspect of it is kept running smoothly at all times. They oversee the guild's leadership team, assigning responsibilities to each of its Officers & Advisors and seeing to it that those responsibilities are met. Founder This is a special rank assigned to the original founder of the guild @Reorx (Daveh), who is currently taking a break from active administration of the Guild. Officer These are the highest-ranking members of leadership, typically responsible for one of the guild's major functions. These players are experienced in every role in the game. Advisor Members of this rank are junior Officers who either don't have time to be full Officers of the Guild due to their other commitments, or are in training to become full Officers in the future. Explorer Users who have proven themselves to be trustworthy and undergone the interview process with @Deandra are eligible for Explorer. Members with this rank have direct access to withdraw items from the Guild Bank and are able to edit Member Notes on the roster. 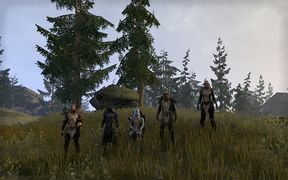 They have been around for a while and can answer most questions you might have about the game, and are typically accomplished crafters who are happy to make armor, weapons, glyphs, potions, or high-quality food upon request. Please see "Guild Bank" below for more information about the promotion process. Scholar Members who are regulars on Guild chat and/or in Guild activities. 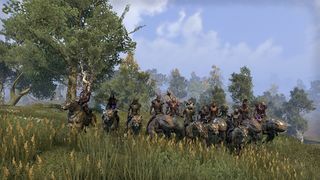 They are able to claim resources in Cyrodiil for the UESP Guild as long as they are playing on a DC character, and the Guild does not already have a resource. Silenced A special rank utilized for very specific purposes but never held by any member long-term. 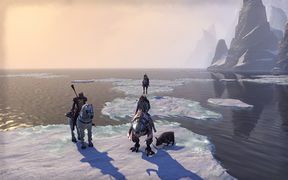 Silenced is used as part of the welcoming and promotion process for new members, and also called into action in the rare event that a regular member needs to be prevented from speaking in chat. Recruit The rank where all members begin. In order to be promoted, chat on our Guild channel, make regular donations to the Guild Bank, or join in Guild activities such as dungeon runs. After you've been a member for about 3 weeks, you will be promoted to Scholar as long as one or more of the Guild Officers knows you well enough. Don't worry if you're not very talkative, we just need to know you well enough to be sure we can trust you. Needs Welcoming Upon joining the guild, new members are temporarily assigned this rank until they are officially welcomed into the guild. Part of this process involves receiving important information about the guild from the Guildmaster. Any member of the guild can view the bank's contents by visiting a banker in most major cities. Direct access to the Guild Bank is restricted to those with the rank of Explorer, however all members are encouraged to make use of the bank's contents so long as they follow the rules below. If you do not have access and would like to withdraw an item, politely ask an Explorer, Advisor, or Officer for assistance in retrieving it. The number one rule of the Guild Bank is "be considerate to other members". The following rules should be purely common-sense. Items are for personal use only, not for sale. Set items are for your character to wear, never for deconstruction. More than 25 Bugloss, Columbine, Mountain Flower, Namira's Rot etc. NEVER take a complete stack of materials. Please leave a small quantity behind (e.g. 10). This will make it more obvious that we need to restock that item in the Guild Bank. Do take as many blue Crafting Motifs as you need to outfit all of your characters. If you have any questions, please ask a Guild Officer! In order to have withdraw access for the Guild Bank, a member must hold the rank of Explorer. To be promoted to the Explorer rank, you'll need to already be a Scholar. You'll also need to have a brief "interview" with @Deandra to prove that you understand how the game economy works when you can sell items to real players, i.e. that the value of items in the Guild Bank is usually unrelated to the price you'd get at an NPC vendor. This process is not intended to be intimidating, and no one to date has ever been denied Guild Bank access. Explorers who are away from the game for 6 months or more will be demoted back to Scholar. However, if they wish to withdraw from the Guild Bank again upon their return, they'll just need to speak to @Deandra as before to ensure that they're up-to-date with any changes in the game economy. These are events held every week at the same time intended for the participation of anyone in the guild. Please note that the timing of our Sunday events is worked around Guild Trader turnover, which is always from 12.55-1.05am GMT (7.55-8.05pm EST or 8.55-9.05pm when Daylight Savings is in effect). Events scheduled for other days of the week will keep the same time for the Eastern US timezone, regardless of Daylight Savings; this means that the start time will change by one hour for those who do not observe Daylight Savings where they live. Dungeon Help Night: Every Wednesday 8.15pm EST / 9.15pm EDT onwards (5.15pm PST / 6.15pm PDT / 1.15am GMT). 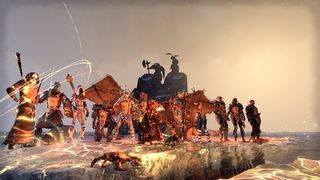 On Dungeon Help nights we have experienced players ready to help you learn the various roles (Damage Dealer (aka DPS), Healer, or Tank) through the Daily Pledges, or any other group dungeon that you would like to try. Runs may be completely casual, just getting used to the idea of playing with others, but we can give detailed advice on roles and help you with your build. Teamspeak is essential, you must be able to hear instructions. Weekly Raffle: Drawn on Sundays 8.20pm EST / 9.20pm EDT (5.15pm PST / 6.15pm PDT / 1.15am GMT). Raffle tickets may be purchased by depositing gold into the Guild Bank. Each ticket costs 500 gold, and you may make lump sum deposits for multiple tickets. Please note that we have a healthy bank balance & NO ONE should feel obliged to donate. 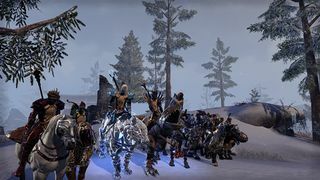 Money raised from the Raffle is used to fund our weekly Guild Trader and for other Guild activities. We also host events that occur less often in order to break from the routine. 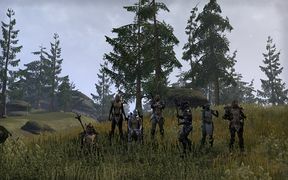 Guild members get the opportunity to socialize with one another, often while accomplishing something as a group. 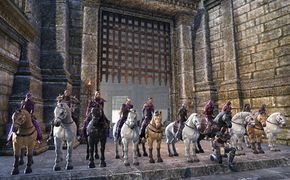 Swap Meet: Prior to the release of new content, members convene at the Guild Hall to trade items and receive free items from the Guild Bank. This type of event is scheduled on an as-needed basis. 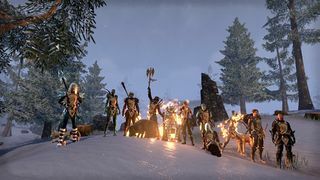 Trivia: Approximately once per month, an evening of ESO-related trivia will be held for guild members to enjoy. Questions range in difficulty from easy to very difficult, and prizes are awarded to the participants who correctly answer the most questions. 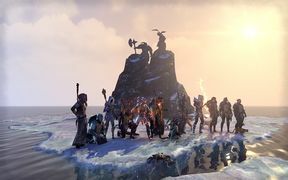 The PC-NA guild maintains a publicly-accessible calendar of upcoming events, in-game holidays, and more. Users can view in plain text from any browser, or add the calendar to their own Google account for additional detail. All times shown are in US Eastern, with other time zone equivalents included. To request an invitation, please send an Officer a message in-game using the mail (#) system, or chat whisper (/w). You can also ask for an invite in the #online channel of the UESP Discord server, or send @baratron a private message on Discord. Purpose: EU equivalent of the NA guild. A rank of Scholar or higher is required to withdraw from the guild bank. Members are asked to try not to withdraw values that exceed what they deposit, as it's based on good faith. Pundits and new recruits are also allowed to use the bank, but must ask another member to make withdrawals for them. The rank of Scholar is open to any member who regularly makes deposits or participates in guild chat/events. The rank of Savant is equivalent to Officer, and is only open to trusted community members. Heraldry: Yellow/Brown on Fang 5 with a Brown emblem of Julianos, the Aedric God of Wisdom and Logic. Colors were chosen to complement the wiki design. To request an invitation, please leave a message on the talk page including your @Username, or send an Officer a message in-game using the mail (#) system, or chat whisper (/w). Weekly Lottery: Sunday evening. Send a mail with 000010001000  to @MissKokane, and pick a number from 0-100. The participant closest to a random number generated by random.org wins the whole jackpot, minus a little for the guild bank. Multiple entries are not possible. Other prizes such as promo codes will also occasionally be offered. 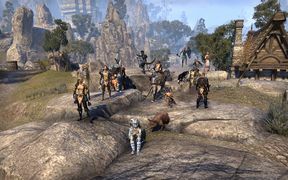 Purpose: PS4 equivalent of the PC guild. To request for an invitation, please leave a message on the talk page including your @PSN Online ID, or send an officer a message through the PS4 message system. 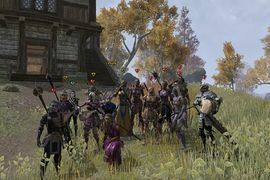 Purpose: Xbox One equivalent of the PC guild. Recruitment: Actively recruiting. More members will open opportunities for a guild trader, raffles, group activities, and more. Heraldry: Black/Gold on Hilted 1 with a Gold Sunburst emblem. Gold represents the color of UESP site pages. 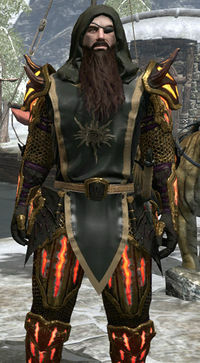 Black complements the color choices of the PC guilds while providing its own unique variation. Guild Bank: All items are for personal use ONLY. Selling bank items is strictly prohibited. Endeavor to "take a penny leave a penny"; if you take something, try to deposit an item of equal or greater value. Officer selection is based on active status, positive interaction, and guild history. If interested, contact an Officer. Crafting Traits: Contact S Carver Orne or Dadditude1994 if you're looking for cheap help with crafting traits. Diseases: Contact S Carver Orne, Dadditude1994 or TrenchRunner78 for a free Werewolf bite. Contact S Carver Orne or kymbeau for a free Vampire bite. To request an invitation, please send an Officer a message through the Xbox Live Message System, or message FioFioFio on the UESP Discord server. 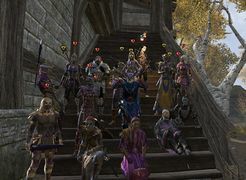 This user is a recruit of the UESP ESO guild on the North American PC server. This page was last modified on 15 February 2019, at 02:25.